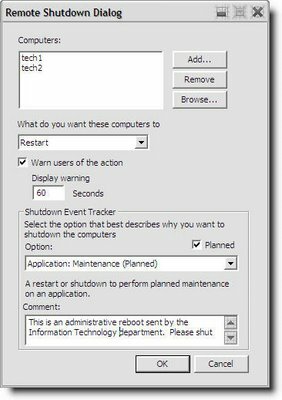 There are many ways to shutdown a Windows system, including the usual CLI and using shutdown.exe itself. But did you know that it has a built-in GUI? shutdown.exe -i will launch to GUI itself. This allows you to set timers, warn users, and even log events. You can even send administrator messages to your users when you’re on your way to launching a reboot or shutdown of their system. This is available on Windows XP, Vista, and Server editions.